It’s become increasingly clear that there’s no single “type” of marijuana consumer. But research has identified certain cultural trends, including a new study that examines the prevalence of cannabis consumption among workers in different industries. The study, published this month in the International Review of Psychiatry, demonstrates that cannabis use is represented in a wide range of employment backgrounds—and some of the industries where using cannabis is most common might come as a surprise. Let’s start with the numbers. 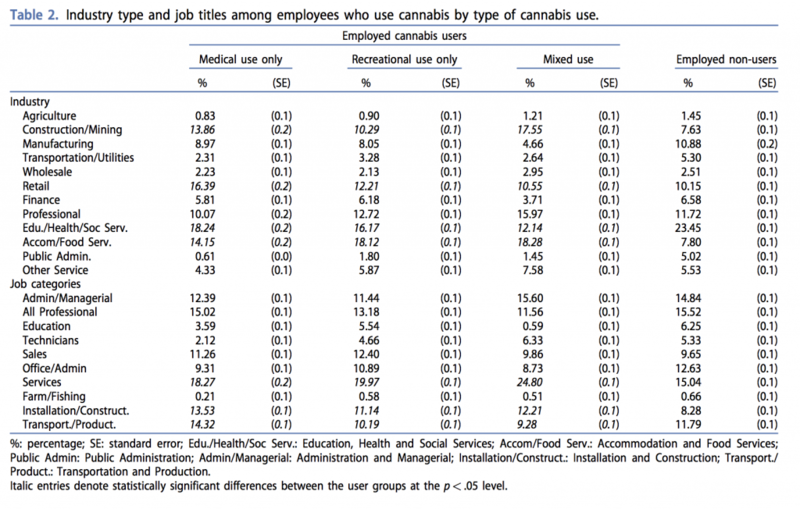 Here’s a list of industries where workers use the most and least cannabis, which the researchers compiled based on 2013 and 2014 National Survey on Drug Use and Health data. The survey asks respondents whether they’ve used marijuana at least once in the past year. The point of the study wasn’t simply to show what kind of workers are using marijuana, but also for what purposes. If a survey respondent reported using cannabis in the past year, their use was then categorized as either medical, recreational or mixed (i.e. some of their cannabis consumption was recommended by a doctor, but not all of it). You can see that breakdown in the table below, but in general, the study reveals a diversity of use types among different industries. People in construction tend to be mixed-use consumers, for instance, and people in food services tend to skew recreational. It’s difficult to explain these sub-trends without more data, however. That said, the researchers were especially interested in cannabis use among construction and mining employees.